The average cost of memory care in Sioux City is $2,585 per month. This is lower than the national median of $4,655. Caring.com has helped thousands of families find high-quality senior care. To speak with one of our Family Advisors about memory care options and costs in Sioux City, call (855) 863-8283. Sioux City is home to over 80,000 people, 13.5 percent of whom are seniors 65 years of age or older. One in 10 of them is believed to have Alzheimer's disease or another form of dementia. For diagnosed seniors who require a higher level of care than loved ones are able to provide at home, memory care facilities offer around-the-clock services in safe, home-like environments. The Iowa Department of Inspections and Appeals, Health Facilities Division, certifies memory care providers as dementia care units, which are designated areas within licensed assisted living programs or residential care facilities. These dementia care units must meet special requirements, including additional staff training and an operational alarm system. Choosing a facility in an affordable town may help free up money that families of seniors with dementia can use toward memory care. For comparison, Sioux City's overall living costs are about 18 percent lower than the national average and 8 percent lower than the state average. Sioux City tends to have warm, humid summers in the 80s and cold, dry winters that dip down into the 10 to 20 degree range. These seasonal temperature extremes may limit the time that seniors can safely spend outside in a memory care facility's yard. Thanks to Iowa's state income tax rules, seniors in Sioux City don't have to pay tax on Social Security benefits. Other kinds of retirement income are taxed, however, seniors may be eligible for a deduction of up to $6,000 on this income. When selecting a memory care facility, safety is often at the forefront of a family's concerns. In Sioux City, there is a rate of 47.52 crimes per 1,000 residents, which is significantly higher than the national median of 24 crimes per 1,000 people. Families may want inquire what security measures a facility uses to keep seniors safe and prevent them from wandering. Memory Care costs in Sioux City start around $2,585 per month on average, while the nationwide average cost of memory care is $4,753 per month. It’s important to note that memory care rates in Sioux City and the surrounding suburbs can vary widely based on factors such as location, the level of care needed, apartment size and the types of amenities offered at each community. 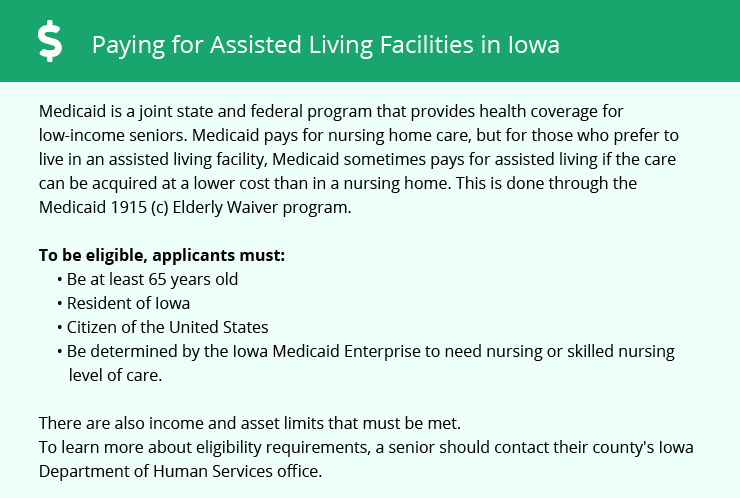 Sioux City and the surrounding area are home to numerous government agencies and non-profit organizations offering help for seniors searching for or currently residing in an assisted living community. These organizations can also provide assistance in a number of other eldercare services such as geriatric care management, elder law advice, estate planning, finding home care and health and wellness programs. To see a list of free memory care resources in Sioux City, please visit our Assisted Living in Iowa page. Sioux City-area assisted living communities must adhere to the comprehensive set of state laws and regulations that all assisted living communities in Iowa are required to follow. Visit our Memory Care in Iowa page for more information about these laws.